only after a careful examination of the different determinants of the hydroelectrolytical balance. injury, leading to hyponatremia and hypovolemia . lation with a good neurological status. J. P. DELABRE ET AL. and chromatography of urinary aminoacids was normal. to 138 mmol/l at day 10.
nism of CSWS remains however poorly under s tood. plasmatic sodium, Osm plasm : plasmatic osmolality. ND: not determinated). 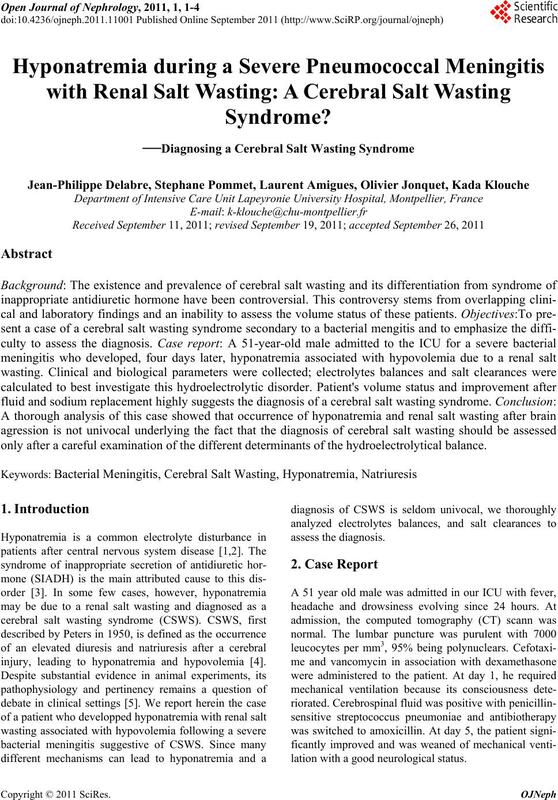 in hyponatremia diagnosis in similar circumstances. Endocrinol Nutrition, Vol. 5, No. 57, 2010, pp.182-186. of Internal Medicine, Vol. 1, No 13, 2002, pp. 9-14.
with Hydrocortisone,” Surgery Neurological, Vol. 4, No. J. P. Peters, G. Weltg, E. A. H. Sims, J. Orloff and J.
American Physicians, No. 63, 1950, pp. 57-64. Science, Vol. 20, No. 76, 2005, pp. 2361-2370. 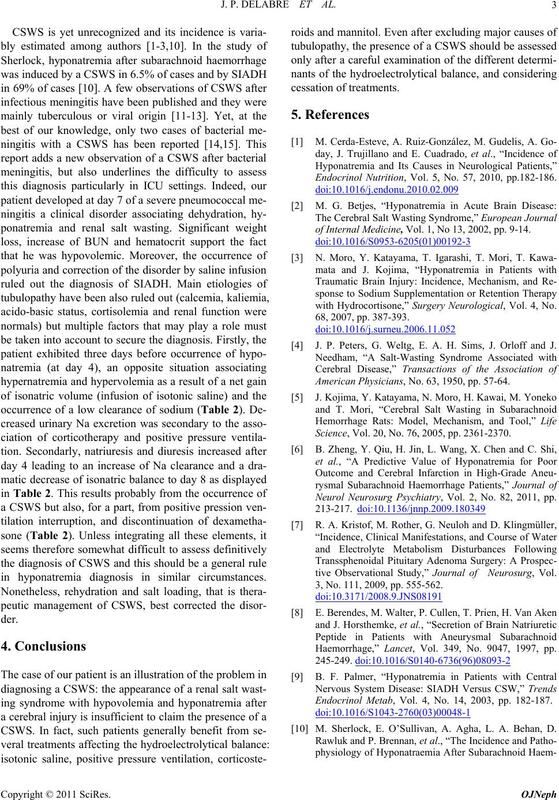 Neurol Neurosurg Psychiatry, Vol. 2, No. 82, 2011, pp. 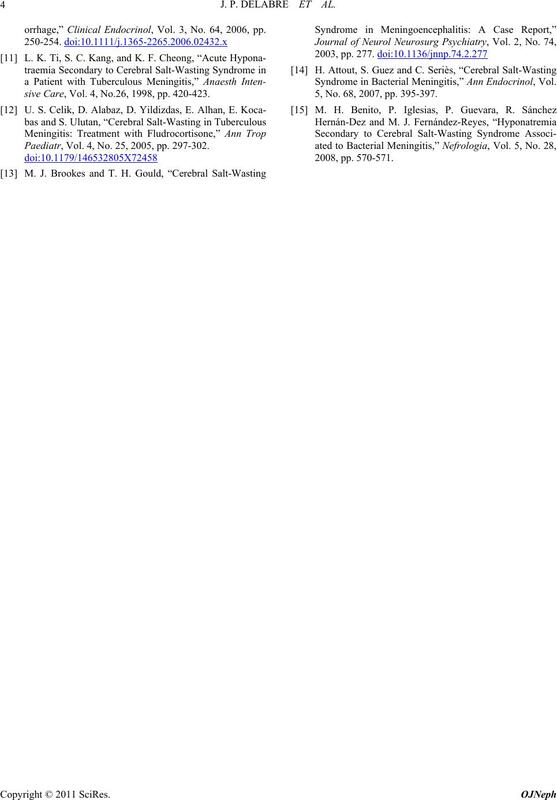 tive Observational Study,” Journal of Neurosurg, Vol. 3, No. 111, 2009, pp. 555-562. 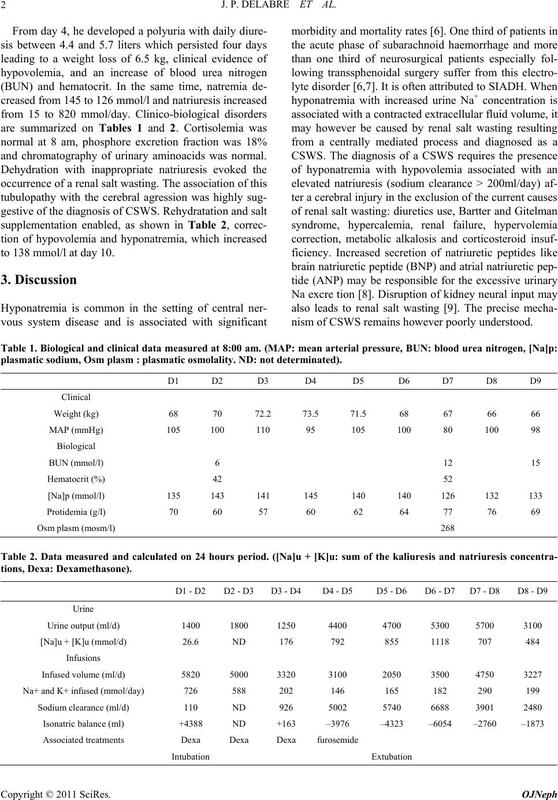 Haemorrhage,” Lancet, Vol. 349, No. 9047, 1997, pp. Endocrinol Metab, Vol. 4, No. 14, 2003, pp. 182-187. M. Sherlock, E. O’Sullivan, A. Agha, L. A. Behan, D.
orrhage,” Clinical Endocrinol, Vol. 3, No. 64, 2006, pp. sive Care, Vol. 4, No.26, 1998, pp. 420-423. Paediatr, Vol. 4, No. 25, 2005, pp. 297-302. Syndrome in Bacterial Meningitis,” Ann Endocrinol, Vol. 5, No. 68, 2007, pp. 395-397.